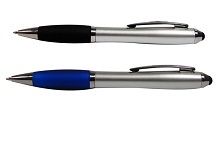 Avoid scratching those mobile phone screens with Curvy Stylus Pens with Logo Branding! Designed with a soft touch tip for a gentle use, the stylus feature is ideal for the latest smart phone devices and virtually any PDA you may come across. Exposure Is The Key To Success! Simply hand these Curvy Stylus Pens with Logo Branding out to customers or even mail them out to customers with an invoice and before you know it - your profit margins will increase! For a FREE QUOTE, please fill in the form regarding our Curvy Stylus Pens with Logo Branding and we'll be able to help you.